This is the all new Pro-Line RC Body Paint Reducer. 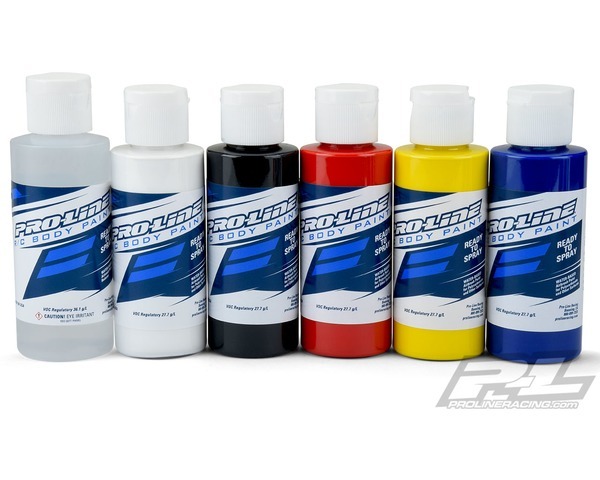 Pro-Lines Team of Innovators have painted literally thousands of RC car bodies over the years and now offers ready to spray R/C Body paints specially formulated to help you achieve the same jaw dropping results we do. Developed by R/C body painters for painters, this water-based airbrush paint is ultra-flexible, extremely durable and easy to use. Have the confidence that you are spraying the best! The Pro-Line RC Body Paint is pre-thinned airbrush paint makes it easy to grab the color you want and spray without the hassle of mixing (using a 0.5mm tip @ 30psi). You may reduce the paint with #6324-00 Paint Reducer for smaller tips or specific applications. Available in single 2 fl oz (60 ml. ) individual bottles or 6 pack sets. Pro-Line has you covered.